SharePoint can also be used to create complex business portals, which gather information into dashboards for use by C-level decisionmakers. At the high end, SharePoint is a Lotus Notes competitor, and also powers complex document management systems. Google, meanwhile, has recently been adding collaboration features to its Google Apps and Google Docs cloud-based applications suites.Neither comes close to matching the capabilities of SharePoint, but many users might not notice the difference in basic collaborative workspaces. It should be easy for Google to surface these features prominently in a future revision to its Android smartphone operating system. The company has already indicated its next smartphone would be an enterprise device, so adding collaboration would be a way for Google to match Microsoft feature-for-feature. There is no comparison in high-end functionality, but Google's ease-of-use and accessibility could, if enhanced, make its collaboration options attractive to business customers. On Windows Phone Series 7, SharePoint has a prominent place in the phone's user interface, which includes a start page and five activity hubs that present people-related, pictures, gaming, music + video, and business features to users. The illustration at left, (click for larger image), shows a panoramic view the Office Hub's user interface. SharePoint slides into view when the user scrolls the panoramic Business Hub opening screen to the left. 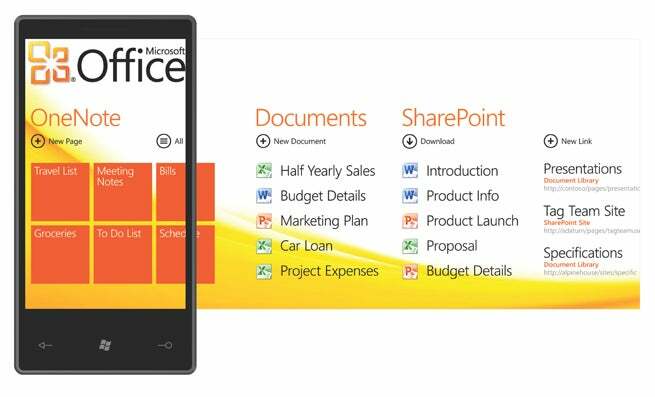 Adding SharePoint capabilities to a business-oriented smartphone is a good idea, although it is impossible to at this point tell what Windows Phone 7 includes that couldn't be done just as well by any Web browser connecting to a SharePoint server. Even with considerable unknowns, however, a smartphone that makes collaboration easy to use ought to generate some excitement, especially among large enterprises where SharePoint is already widely deployed and highly customized. How those customizations will be supported on smartphones, however, is also not clear at this time. My bet is that these will become key reasons for business users to upgrade to Windows Phone 7, but that will remain to be seen as details of the new smartphone OS continue to unfold in coming months.